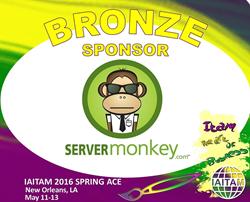 ServerMonkey will be attending IAITAM Spring ACE as a bronze sponsor for the first time this spring. ServerMonkey will be attending IAITAM Spring ACE as a bronze sponsor for the first time this spring. IAITAM Spring ACE will be held at the New Orleans Marriott May 11 - 13, 2016. The goal of the 3 day event is to broaden best practices and recognition of IT Asset Management as a core business competency. Attendees will find themselves in the perfect storm of knowledge and examples of real world ITAM experiences with days packed with dynamic keynotes, education, networking, entertainment, exhibitions and delectable fare. The driving force of the IAITAM Annual Conference and Exhibition has been to grow the ITAM practice through education and the most targeted networking since 2002. ServerMonkey will be hosting booth 31. Trained Monkeys will be on hand to discuss your ITAD needs and hand out swag. About ServerMonkey - ServerMonkey (http://www.servermonkey.com) provides new and pre-owned IT hardware including servers, networking equipment, workstations, laptops and desktops. Customers of all sizes, both small and large enterprise, utilize our trained engineers and technicians to conduct on-site services on a global scale. Servermonkey’s value-added datacenter services include IT Asset Decommission and Disposition, Asset Recovery and Spare Parts Harvesting, Kitting, and other customized programs designed to improve ROI on IT hardware. Our OHSAS 18001:2007, ISO 9001:2008 and ISO 14001:2004 certified headquarters is located in Houston, Texas, and we ship internationally through hubs in Amsterdam and Hong Kong.